15 Minute Tomato Basil Sauce - Best Spaghetti Sauce Ever! 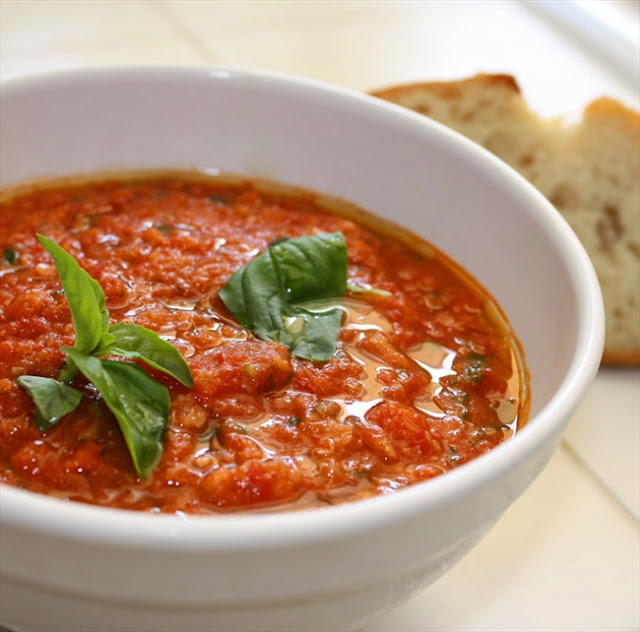 Quick & Easy Tomato Basil Sauce - The Best Spaghetti Sauce Ever! I get more email about this quick pasta sauce than I do for any other recipe I talk about. My Italian family has cooked this fresh tomato basil sauce for a hundred years. It's my favorite recipe and technique to share with people that I love. Mi famiglia also does a slow cooked 8 hour sauce filled with meat, but that is Sunday sauce and is more rare in these times. Our quick tomato basil is a wonderful light sauce that comes together so quickly that there is no need to ever buy a jar of sauce! I use this bright snappy sauce on everything - to sauce grilled chicken, sliced steak, halibut or swordfish, to simmer mussels and shrimp. It's delicious spooned over ricotta with lots of shaved Parmesan, or to simmer fresh summer vegetables like zucchini, eggplant, or spaghetti squash. Make an Italian Chili with sweet fennel sausage, cannelini beans, and enough sauce to simmer. Please try it! Cook the garlic and crushed red pepper flakes in the olive oil in a heavy saucepan, over medium heat for 1 to 2 minutes, stirring constantly, until garlic is softened and fragrant. Do not brown the garlic. If your oil is too hot, move the pan off the burner. Our intent is to infuse the oil with the flavor of the garlic and crushed red pepper to more fully blend into the tomato. Add the San Marzano Italian crushed tomatoes and stir to combine. Add 3 or 4 whole stems of fresh basil. Just take them out of the package, arrange them into a little bouquet and toss them in whole! Season with a good teaspoon of Kosher salt - 8 to 10 good turns of a fresh pepper mill - add a cup of white wine if you have it. Stir your chiffonade of basil into the sauce - cook another 2 to 3 minutes - and that's the dish. This entry was posted in Bariatric Recipes, Sauces & Salsa and tagged Dressings, Dressings, Sauces & Salsas, Vegetable Dishes, Vegetarian.